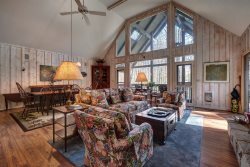 Located in Chattooga Club, this charming mountain home is built from Appalachian log timbers reclaimed from old settlers’ cabins in Tennessee and South Carolina. Exposed beams, old wood paneling and wood-burning fireplaces give it the feel of a real cabin, but with great light and space and all amenities. It has 3 bedrooms, 3.5 baths and nearly 4000 heated square feet, a garage, and nearly 800 square feet of covered and open porches which provide gorgeous, miles-long views to the west and south. Built on the edge of steep cliff, it overlooks a branch of the Fowler River and Lake Chattooga, and the muted sound of water running over the dam below provides day and night tranquility that enhances the ambiance of the house and its views. A delightful covered outdoor porch, with its own working fireplace and great western views, is the centerpiece of the house. The master bedroom on the main level, and guest bedrooms on the upper and lower levels, allow for maximum privacy. The master suite is large, with its own fireplace, and en suite bath and closet. The lower level has its own large family room with fireplace, perfect for a rainy day or playful children, a large twin-bedded bedroom, and a temperature controlled wine cellar. The upper level has another large bedroom with a king size bed, a long gallery with a built in work area, drawer and shelves, and a bathroom.